Home | Blog | Terrorise Other Beachgoers With This Giant Beach Ball! Terrorise Other Beachgoers With This Giant Beach Ball! Everyone needs this twelve foot beach ball in their life…the reviews are completely hilarious! If you find that a towel and bag aren’t enough to claim your spot on the beach, we may have just found the answer to your problem. 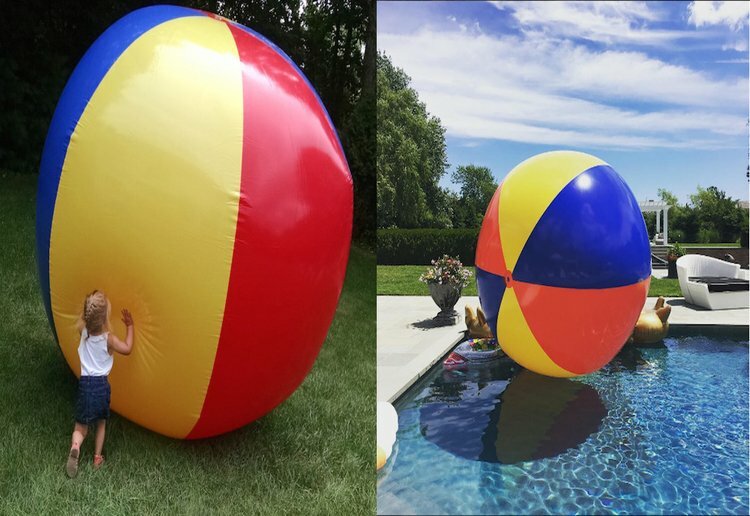 Enter The Beach Behemoth – a twelve foot beach ball that has prompted some hilarious reviews on Amazon from parents worldwide. Buying an enormous beach ball is more than just the ultimate example of a fun impulse purchase that will keep your kids entertained for hours. One Dad took to the Amazon review section to recount his experience of inflating the nearly four metre ball. “We took this ball to the beach and after close to two hours to pump it up, we pushed it around for ten fun filled minutes. That was when the wind picked up and sent it hurtling down the beach at about 40 knots. It destroyed everything in its path. Children screamed in terror at the giant inflatable monster that crushed their sand castles. Grown men were knocked down trying to save their families. The faster we chased, the faster it rolled.” If that’s not a memorable day out at the beach, we don’t know what is – two hours of stress and heat for ten minutes of money can’t buy fun…sounds reasonable to us! The take away message – if you do choose to try The Beach Behemoth for yourself, do so at your own risk. Once it’s inflated, who knows what chaos it might unleash! Would you buy The Beach Behemoth? Let us know in the comments! I’m glad the little one in the photo is on lawn and not a concrete path, Thar balloon could suddenly take off in the wind and the little one go “splat”. The lawn would be hard enough. Not suitable near water either. It may be OK for adults to have some fun but I wouldn’t buy one. I wouldn’t want to risk hurting others with it. Seems a tad dangerous and ridiculous. Will NOT be on my list for birthday and xmas presents. What a waste of two hours to blow it up then it has a mind of it’s own with the wind and lets face it the beach is windy. No thank you. I probably wouldn’t buy one. If I did, I would expect to use it once as I think it would be too hard to control at the beach. I’m picturing it blowing away or floating out to sea. Hope it’s easy to inflate and put down! Otherwise this would be staying st the beach! Bahaha, hilarious reviews. Try at own risk…. I wouldn’t know what havoc it created because I’d be lying semi-comatose on the ground from the effort of blowing the thing up!